Seminary is a college or university that prepares young men from the Archdiocese of Seattle to be good, effective priests for the people of God in Western Washington. 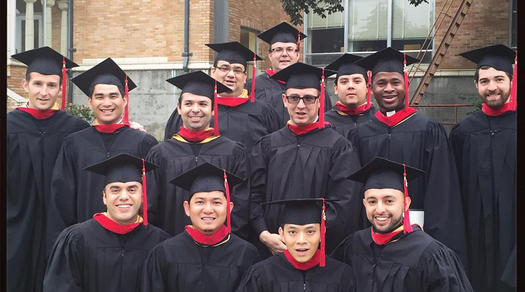 Our seminarians study in seminaries across the United States and Europe. Typical studies combine the four primary areas of formation for our seminarians: Spiritual, Intellectual, Pastoral, and Human Formation. These are the basic tools of seminarian formation. All activities, classes, retreats, etc. stem from these four pillars. Some men begin their preparations for the priesthood after already obtaining a college degree (and even graduate or professional degrees). Usually they need philosophy and preliminary level theology before moving on to graduate level theology. Therefore, they enter a one-year or more often two-year program called Pre-Theology, in which they earn a Masters in Philosophy. Once prepared in this way they enter the usual four-year theologate. They spend a total of five or six years in the seminary. Along with formal training in philosophy and theology, the spiritual life and practical skills for priesthood, some diocese have seminarians spend some summers as pastoral interns in a parish and sometimes this is extended for an entire year where it would be useful. Seminarians also participate in special summer programs to deepen their spiritual life or their appreciation of the Spanish language and Hispanic culture.